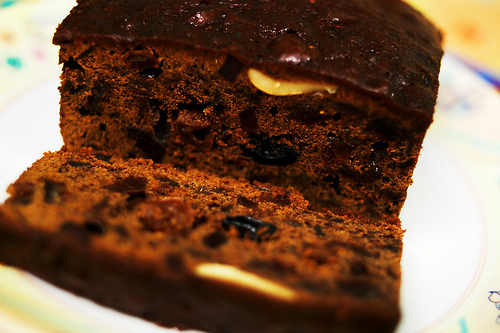 For a Malayalee, Plum cake is integral part of Christmas celebration. Jalina Shalabh shares the recipe of her famous plum cake preparation. Try it and please let us know if it was good. I learned this recipe from my Mom. She made this every year around Christmas. Only difference from her recipe is, use of cashew nuts, that are from my Dad’s ‘Paranki Mavu’ and dry fruits that were dried at home. I never got a chance to make it, since my two elder sisters (who thought I was adopted from an orphanage in Thirunalvelli, did not let me help at all in this task. Our helper ‘Raman’, who was from Thirunalvelli helped me to make a fake cake all the time around Xmas. So when my sisters distributed plum cake to the neighbors and friends, I used to distribute my sand cake to Raman and our colony choukidaar and our ‘doodh wala’. Now don’t get alarmed, I told you I learned this from my Mom. After my sisters went off to college and my Mom retired from her teaching career, she taught me how to make this very special cake which is very dear to me. I don’t think I have mastered it like my Mom but she says I am close enough. 3)Keep this at room temperature over two weeks atleast. 4)Dice or crush the nuts into small pieces. :- You can do these steps the day before you plan to make the cake. 7)Measure and keep ready the flour, sugar and the flavorings. :- To make the caramel, use a white enameled pot, if you have one. The light surface will help to see exactly the caramelizing process. If you don’t have one, use a medium saucepan. 9)Turn the stove to high and place the pan on the stove and let it boil. :- Don’t stir the contents at all. As sugar melts and caramelizes, you may swirl the pan a bit once or twice. 10)Within 7 – 10 mins, a cherry wood colored caramel forms. 11)Immediately, remove the pan from the stove and very carefully add 1 cup of water to the caramel. :- You may hold the pan above the sink and slowly add the water, for it may splash. 20)Bake for 1 hour at 350 degree F.
:- Check for doneness by inserting a toothpick in the middle of the pan. If the toothpick comes out clean, the cake is done. If not, bake for another 10 – 15 mins and check again. 22)Pierce the cake with toothpick, and pour Brandy (about 3-4 tablespoon on each) on top and let it soak. Hi, I’m going to make this cake, and I just wanted to make sure its right- 12 eggs? And in your opinion which is better- rum or brandy? Sorry for being mute…Both brandy ad rum are good. My personal preference is brandy. Yes 12 eggs are needed to for this quantity…. I wanna make this cake today. What happens if I dont use 12 eggs…? Can I alter that somehow…please let me know.. I want to try your cake recipe. Looks very interesting. Where can i find Candied fruits and orange and lemon peel in US? This is very good recipe…I made this without eggs..! I used double quantity of butter for that. Vegitable oil may be used..and it will be right for more health conscious peoples. I had tried this last year and it was a superhit, so i decided to do this every year on Christmas for my family. Thank you so much for posting this recipe, God bless!